Endometriosis is a condition which ails 6-10% of women during their reproductive years. In Endometriosis, the cells of the uterine lining start to grow outside the uterus itself and along the peritoneum, the lining of the abdominal cavity. 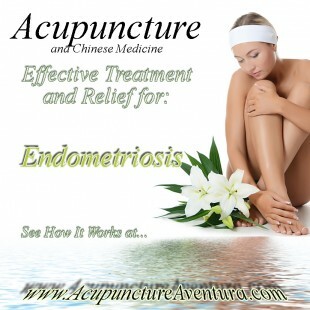 Endometriosis is considered to be a leading cause of female infertility, and if you have are having trouble conceiving, or if you can no longer bear with the pain of endometriosis, you may want to consider acupuncture therapy as a safe and healthy alternative to conventional medicine. Acupuncture will not only alleviate your symptoms, but it will improve your chances of pregnancy and will help you start your family as soon as possible. These symptoms could easily be caused by other conditions, so always be sure to get all the appropriate medical tests done in order to rule out other possibilities. Usually, the medical approach to endometriosis is managing the pain and controlling the progression of the disease. There is no known cure. Doctors will either prescribe hormone altering pills which may have adverse effects on your body, or else they suggest surgery to remove the cells from outside the uterine cavity, which poses its own risks. Pills are not a permanent solution; you have to rely on them for the rest of your reproductive life, and keep on pumping chemicals into your body, thereby creating a toxic atmosphere for you as well as your baby. Surgery, on the other hand, leaves your body too weak to sustain another life, and your plans to start a family get further and further delayed. This is why many women are opting for acupuncture in the treatment of endometriosis. When compared to chemical or surgical intervention, acupuncture is a safe, healthy, and non-invasive method for effectively treating your condition. Acupuncture allows for energy to pass the main meridians and pathways of the body, allowing it to release endorphins and other hormones associated with healing. The resulting biochemical changes influence the body’s homeostatic mechanisms and the stimulation of certain acupuncture points reduce sensitivity to pain. All this means that the symptoms of endometriosis are better managed without polluting the body with unnecessary chemicals. Studies have shown that acupuncture treatment for endometriosis leads to reduced sensitivity to pain, regular period cycles, as well as the alleviation of swelling, inflammation, and abnormal bleeding. For improving fertility, it may be used in combination with other methods such as IVF, but can be done in isolation as well. At our center in Aventura Florida, we believe in a combination of eastern and western medicine to help you receive the best of both worlds. Acupuncture therapy has no adverse affects for you or your baby, and can help you start a family in a healthy and safe manner. To make an appointment or to verify your insurance, call us at (786) 537-7022 and we can begin your treatment immediately.